If you’ve been tuning into astronomy news lately, you’ve probably heard about a number of cool new exoplanet discoveries, like those in the TRAPPIST-1 system, continuously rolling in from our telescopes hard at work. But no matter how, when, and where a new exoplanet is discovered, there’s always that question burning at the back of our minds: could this exoplanet have Earth-like life? 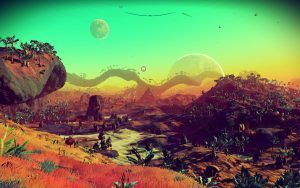 Figure 1: A screenshot from the open-universe space exploration video game called No Man’s Sky. Even with Earth-like constraints, the sky’s the limit in terms of the many living worlds we can imagine are out there. [No Man’s Sky]. Today’s astrobite focuses on another important requirement: the exoplanet’s atmospheric composition. Here on Earth, for instance, we have a lot of wonderful plant-based and plant-like creatures (like trees) that produce oxygen through photosynthesis. Then other creatures here (like humans) use that oxygen to survive and thrive. So for an exoplanet to have Earth-like life, we expect it to have a buildup of oxygen. You might imagine, then, that we should be looking for oxygen on these exoplanets, as a sign of Earth-like life — and you’d be right, mostly! But unfortunately it’s not clear that a buildup of oxygen will “always” be a sign of Earth-like life. Instead, an exoplanet could possibly accumulate oxygen from purely chemical, completely not-organic-or-life-related (aka, abiotic) processes. 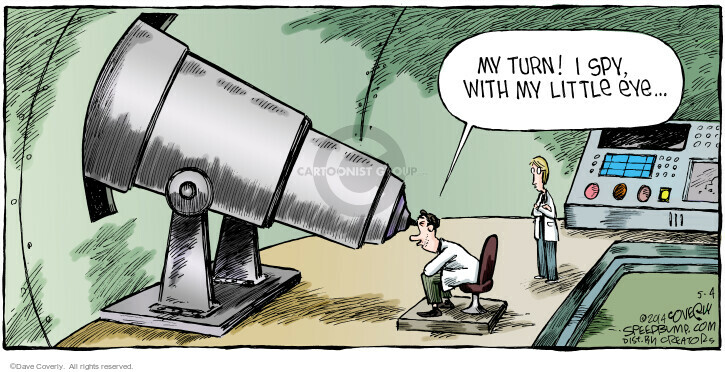 This means that if we find an exoplanet that has a buildup of oxygen, we need to be cautious and somehow make sure that we haven’t just discovered a false positive (i.e., a case where what we think to be true is actually very false). Today’s authors present a nifty theoretical framework for thinking about and modeling the atmospheres of exoplanets, which can help both characterize and predict the atmospheres of the many new exoplanets we’ve observed and continue to observe. The authors did many, many other cool things in their paper, but here we will focus on understanding the backbone of their theoretical framework. The authors use the concepts of ‘redox’ as the main variable of their model. ‘Redox’ is an abbreviation for ‘oxidation-reduction reaction‘, which is a fancy term for a reaction involving the exchange of electrons between two chemical species. The atom, molecule, or ion gaining an electron(s) is ‘reduced’, while the atom, molecule, or ion giving up an electron(s) is ‘oxidized’. Combustion is a common example of a redox. When you burn firewood at, say, a campfire, the carbon (C) from the wood reacts with the oxygen (O2) in the air, producing carbon dioxide (CO2). In this case, the carbon gives up four electrons and is oxidized, while the oxygen collectively gains four electrons and is reduced. If a planet has an atmosphere that is very oxidizing, that means there is, in a sense, a net demand for electrons. That means we would expect O2, which wants to take electrons, to abiotically build up in an oxidizing atmosphere, because there would be no net supply of chemical species floating around for the O2 to react with and take electrons from. So to evaluate if an exoplanet would likely abiotically build up O2, we want to check if and when its atmosphere is likely to be oxidizing — and that depends on the planet’s chemical composition. 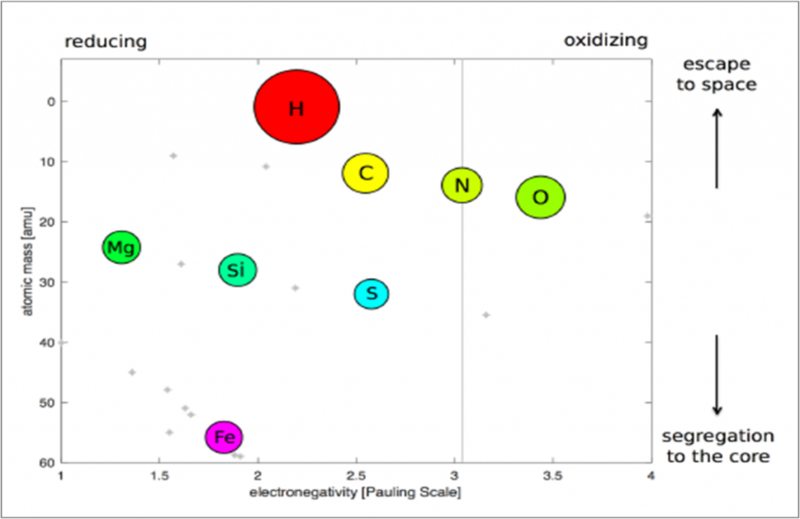 Figure 2 shows different elements from the periodic table as a function of electronegativity (which is basically how oxidizing versus reducing the elements are) plotted against atomic mass and abundance. With Earth as our example, we expect that the less massive elements like hydrogen (H), carbon (C), nitrogen (N), and oxygen (O) largely hang out in the volatile layer (which includes the atmosphere) and upwards towards space; magnesium (Mg), silicon (Si), and sulfur (S) largely get caught up in the planetary crust and mantle; and the heavy element iron (Fe) is largely trapped down in the core. Studies have shown that, just like Earth, planets of around 1 to 10 Earth masses tend to split into these three major layers: volatile, mantle, and core. So to understand how oxidizing the atmosphere of a planet in this mass range is, we need to understand how these three planetary layers interact and exchange these different elements. Where N is the total oxidizing power, Ni is the number of atoms of some element ‘i’ (like carbon or oxygen), and pi is the oxidizing potential of element ‘i’. An atom of oxygen, for example, takes two electrons, so it has an oxidizing potential of +2. An atom of hydrogen, on the other hand, gives away one electron, so it has a negative oxidizing potential of -1. Finally, the Σ in the equation says that we want to sum over all elements ‘i’ in the layer. The authors drew out a model of the three-layer planetary system, as shown in Figure 3, and assigned a total oxidizing power N for each layer. To calculate how oxidizing the atmosphere is with this model, we must track the flow of elements between these three layers over time. 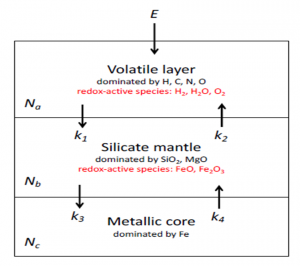 The authors discuss a lot of the cool processes that can allow transport of material between these layers at different times in the planet’s evolution. For example, when the planet is young, its mantle layer can be partially or fully ultra-hot and molten, like an ocean of magma. During this phase, the liquidy mantle layer and the atmosphere-containing volatile layer can interact and exchange materials much more easily. But once the planet cools down and the mantle layer hardens, the interactions get more complicated. Depending on the planet’s geodynamic structure (such as any churning plate tectonics and gas-spewing volcanoes), the mantle layer can shift around and still allow material to flow between these planetary layers. And over time the much-less massive elements, especially the reducing element of hydrogen, can leak out of a planet’s atmosphere and escape to space (that’s the ‘E’ term in Figure 2), also changing how oxidizing the atmosphere is. Once we have a good handle on how these conditions and processes play out on other planets — such as answers to the tough question of how geodynamics evolve on planets other than Earth — we can apply this framework to dig out any planetary scenarios where compounds like O2 could build up abiotically over time. And for those seemingly habitable exoplanets that appear very unlikely to abiotically build up O2, we can be cautiously optimistic that any oxygen buildup we do see might come from a biotic source — exactly what we’ve been searching for all along.